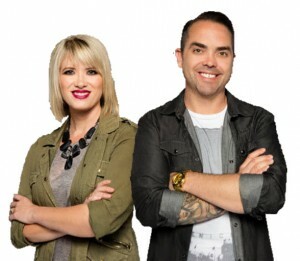 104.5 the U is excited to announce the addition of its first-ever syndicated morning progam! “Brooke & Jubal in the Morning” will be very familiar to our fans in Washington and Oregon, where it’s been steadily been growing in listenership since launching on MOViN 92.5 in Seattle in 2011. 104.5 the U is doubly excited to get in on the action because co-host Brooke Fox is a graduate of the University of Montana School of Journalism! The show will air weekday mornings from 6-10 am, which means 104.5 the U program director Aubrey Nilsen will be moving to the midday slot while our pal Mike Smith sweeps up from 2-6 pm. Tune in to the show and feel free to let Aubrey know what you think in the comment box to the right or on the 104.5 the U Facebook page! And HUUUUGE thanks to the sponsors who help keep Brooke & Jubal entertaining the Missoula-area masses each and every weekday: First Security Bank, Betty’s Divine, Orange Theory Fitness, CostCare and Greenhouse Farmacy!